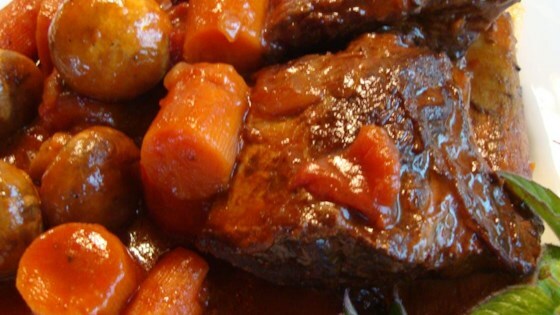 "Beef short ribs are slowly braised with Bloody Mary mix and red wine in this savory dish. I would normally use some garlic in this, but this recipe was developed for a good friend who is allergic to garlic. I serve this with homemade spaetzle." Preheat an oven to 350 degrees F (175 degrees C). Season the short ribs with salt and pepper, and set aside. Heat an oven-proof Dutch oven, or wide, shallow pot with a lid over medium-high heat. Stir in the olive oil and butter until the butter has melted. Stir in the onion, and cook until the onion begins to soften, about 3 minutes. Add the leek, and continue cooking until the onion and leek are lightly browned. Remove and set aside. Brown the short ribs in the hot Dutch oven until browned on all sides, about 3 minutes per side. Once browned, sprinkle the reserved onions over the ribs, pour in the wine, beef stock, tomatoes, and Bloody Mary mix. Nestle the carrot chunks among the ribs. Bring to a simmer, then cover, and place into the preheated oven. Braise in the oven for 2 hours, then add the mushroom caps, recover, and continue cooking 1 hour more. Easy and excellent. The onion, leeks, tomatoes and broth braise the ribs perfectly!